This enchanting safari lodge in South Africa is unfenced, so animals move around freely in their natural environment. This delightful safari lodge in South Africa offers comfortable accommodation in 6 luxurious tents that overlook the Ngwenyeni Dam. Each tent boasts a romantic slipper bath, outdoor shower overlooking the dam and a private verandah. Activities at this South African safari lodge include game drives, bush walks, bird watching in the hide overlooking the waterhole, a swimming pool and a butler service. 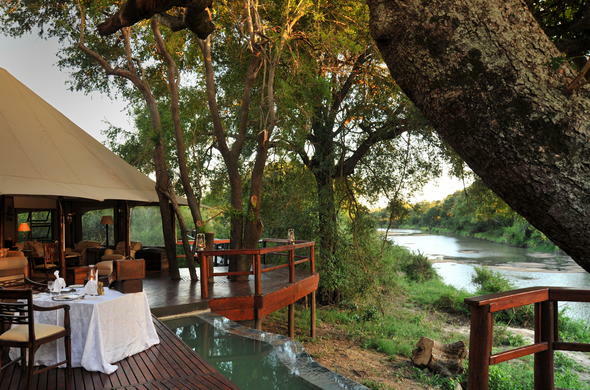 This enchanting South Africa lodge is unfenced, so wildlife move around freely in their natural environment. This safari lodge in South Africa accommodates children over the age of 8 years. Children will be allocated a separate vehicle with their parents and will be catered for separately at dinner. All kids are charged the full adult rate and will be accommodated in their own rooms. Due to the unfenced border, it is the responsibility of the parents to ensure that their child is accompanied at all times. Children under the age of 8 may be accommodated if one of the camps is booked for the exclusive use of a party.